The Artega brand enters a new vehicle type with the Artega Karo. 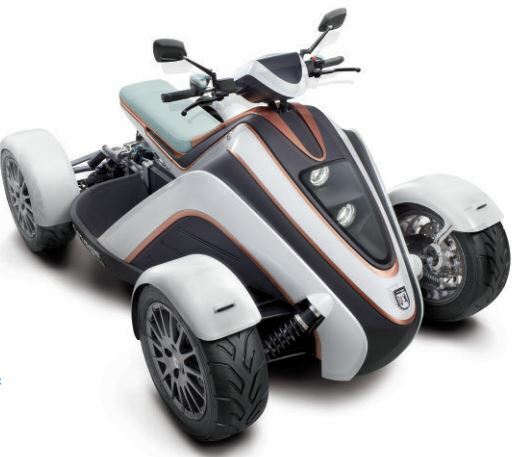 The new German electric fun mobile combines the benefits of ATVs, jet skis, and motor scooters. The two-seater Artega Karo is a concept vehicle that is prepared for serial production. The racing-car-like chassis, in connection with the direct power of the electrical motor, provides a driving experience that exceeds the proverbial “karting feel”. The Artega Karo accelerates from 0 to 50 mls in under 5 seconds. Beautifully shaped leg shields with integrated reinforcement of high-strength steel optimise safety and splash water protection. The fun factor is increased by a removable sound module with smartphone connection. Bluetooth can be used to play back the desired music from any device (mobile phone, tablet, MP3-player). The Artega Karo‘s charging function is a perfect asset as well: The charger and charging cable with a regular protected plug are on board – just like in a vacuum cleaner.